Magnum Ui5 or eJoe Gadis? If you are scratching your head between these two recreational commuter eBikes, I’ll outline the basic differences to help you make your choice. Both are wonderful bikes and represent the best value you can get in a recreational eBike. The frames are of similar design and geometry. The matte white Magnum with its black parts is very classy and stunning, though you will have to take more time to keep it clean for it to be looking it’s best. It is also available in matte black. The vanilla Gadis is finished in a glossy pearlescent paint, and is also available in a matte black. Fit and finish on both bikes is excellent. Bicycle components are similar: Shimano rapid-fire gears, Tektro disc brakes, suspension fork, comfy gel saddle, etc; and both bikes come fully accessorized stem to stern. The Magnum, however, comes with luxurious and smooth-riding Schwalbe Big Ben balloon tires, while the Gadis employs Kenda eBike tires which still ride and wear pretty well. Also, I would rate the various small parts a tad better on the Magnum than employed by the Gadis. 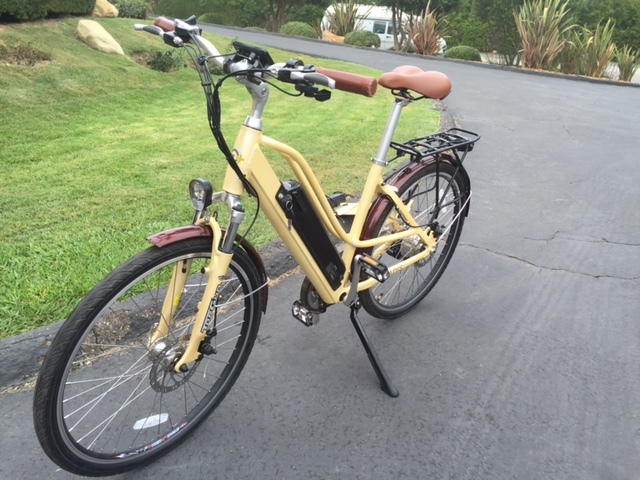 Both bikes have strong 350 Watt hub Motors, though the Magnum uses a premium Bafang motor. One big difference is in the battery, though both use the superior Samsung 18650 cells with LiNMC chemistry. The Magnum has a big 36 Volt/13 Amp hour battery which means it has 468 Watt/Hours of storage - good for up to 40 miles of riding. The Gadis has a massive 48 Volt 11 amp hour battery, or 576 Watt/Hours, which should give you another one fourth more range while running at a little higher efficiency! Also, the charging and USB port on the Magnum is located in the rear of the battery making it a bit more difficult to reach, whereas the ports are conveniently located on the front and side of the Gadis battery. The batteries on both bikes lock securely and are removable allowing either off or onboard charging. Another advantage of these big batteries besides their long range is that you do not need to charge them as frequently. The Magnum has 6 levels of cadence-sensed pedal assist from low to high, while the Gadis has 4, both read-out on bright LCD displays. Both bikes also have a throttle, but here is another big difference between them. The Magnum throttle will only take you up to the speed of the assist level, allowing top speed only in level 6. Also, the throttle is of the standard thumb variety, while the Gadis has the new ‘Swipe’ throttle which activates horizontally to the handlebar grip for a more ergonomically-friendly engagement. Also, the Gadis throttle is totally independent so you can accelerate up to top speed from any level of assist. So how does one choose between the two. Well, you might like the look and color of one over the other. And if you don’t need the super long range and want a bit smoother ride, the Magnum may be for you. The 36 Volt electronics work great and provide excellent performance. However, if you need more range or less frequent charges, and an independent throttle, the Gadis is your bike. Either way, at $1699 fully accessorized, both are fantastic bikes and great values. Feel free to call us any time to consult to figure out which would work best for you.